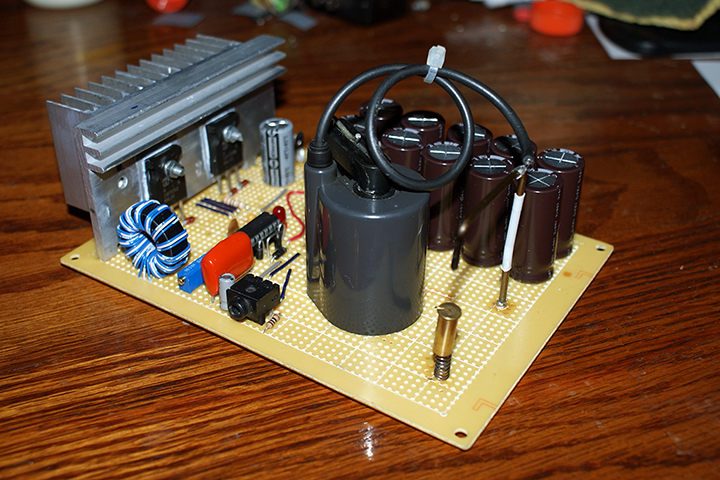 My last plasma speaker, which used only one mosfet, got a bit too hot to run without a bucket of ice water nearby. To cut down on that heat I decided to use a half bridge switch to drive the flyback this time. A half bridge is a topology that uses two mosfets that flip flop, each taking a turn conducting current. This reduces the load on the FETs during their switching times, and thus reduces the heat. 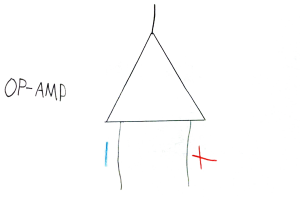 Below is a pictorial schematic of the device, and here is a regular schematic for the electrically inclined. For those that like instructables, here’s one. By sending more current through an arc, you produce a hotter arc. Hotter arcs will have a higher pressure, and by varying the current through an arc you create varying pressures, something commonly known as sound. The 10kΩ pot still controls the frequency, and a lower frequency means higher voltage. The sweet spot was around 50kHz for my flyback, but it may be different for yours. It’s a trivial matter to turn a knob though. The 1uF cap must be either an MKP, mylar or foil cap. No electrolytics! Its function is to block excess DC current from flowing through the transformer, since capacitors block DC yet pass AC. There is a gate drive transformer. What this does is provide an isolated gate drive for the upper mosfet preventing it from dying, and it is required for the circuit to work properly. A GDT is simple to make: all you do is take a bundle of 3 wires and wrap them around a ferrite toroid. I used 14 turns on a 2.5 centimeter toroid, but other designs may work better for you. Ferrite toroids can be bought for about a dollar online if you don’t have one laying around. The GDT must be phased correctly for this to work, otherwise your mosfets blow up. What is phasing you ask? Phasing is the direction of the coils in a transformer. For this to work, one of the coils on the mosfet side must be ‘reversed’. On schematics phasing is marked by dots, and you can get a better picture of what’s supposed to be done by looking here. 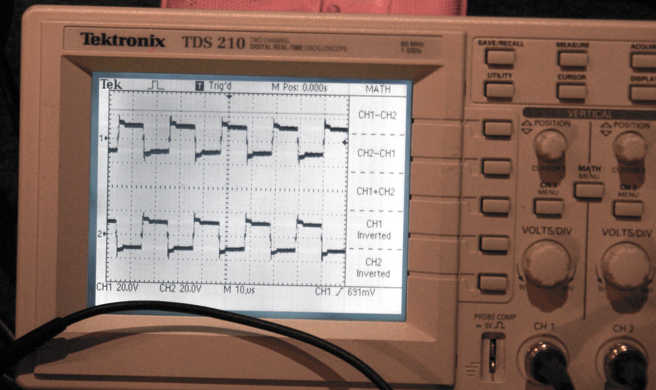 A properly phased transformer looks like this on a scope; one wave is inverted. Too loud a signal can and will overload the chip. When you put audio in, set the volume to 0 then slowly turn it up. When the music becomes distorted that’s as loud as it’s getting. It’s not terribly loud, but it is still easily heard in a quiet room. You must have a clean audio source too, no electrical noise. I used my computer, and it would appear that iPods don’t work too well. It’s trial and error with the sources. Youtube video of it playing some supertramp. It sounds much better in real life (more bass). Sorry Germany, UMG blocked the video in your country. What is the rating for the flyback transformer that you use? i keep burning out my fly back everything works, but i keep burning out my flyback when i boost the input voltage to 48 volts. since it’s just an autotransformer are there any other alternatives? Could I just use another High voltage transformer that has a higher VA rating? 8-10 kv range? It’s not an auto transformer, but there is no reason why another high frequency transformer wouldn’t work in lieu of a flyback. If the transformer has an integrated tripler (for a CRT), is there anything that needs to be wired differently? I don’t believe such a transformer would work then, unless you use a large current-limiting impedance on its output. Otherwise you burn out the diodes inside. First mine works great except I seem to be not getting such a big arc because of only using two capacitors. If I add more capacitors such as you have in your video is it just two banks of 5 capacitors in sereis then in parallel leading to the flyback 6 turns? Is everything connected correctly? If so, does the chip itself even work? Today i try take GDT out and found that ic doesn’t get hot. I didn’t know why , i wind like you said. 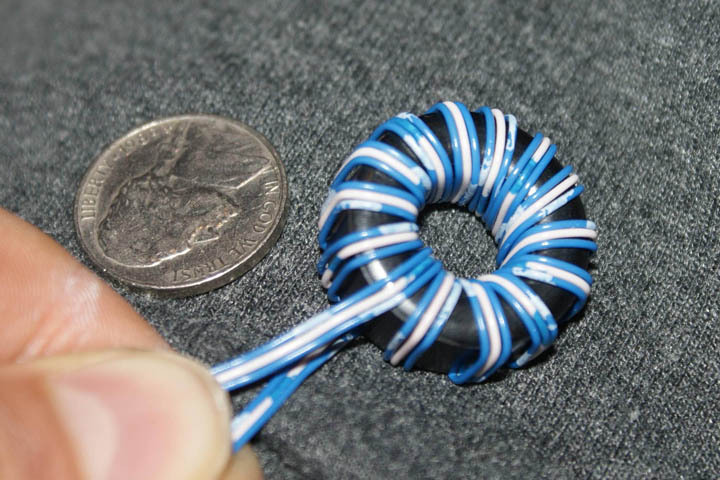 14Turn 28awg on 3cm toroid. Every connection is correct i double checked it. I change new ic and it same, Getting hot. Do i need to rewind GDT? I have fixed my previous problem by using a bigger transformer. I am now trying to Run this with a 150Vdc input. i’ve bought 2x200v caps and have made a suitable linear powersupply and used a power resistor and shunt regulation to mitigate the cap Inrush current at the begining. my problem now is that my mosfets have blown up, i used two irfp350N s. i now realize that the specs where too low in terms of current. What type of mosfets would you recommend to run this at 150Vdc? what do you think the maximum voltage rating should be ? Whatwould the maximum Rds that wyou could get away with be? Or can i get away with lower values mosfet, any suggestions? Twice the expected voltage is usually a safe bet, but what you have chosen there is fine. An 80mohm RDS on is okay, but I wouldn’t go above 0.1 ohms if you can avoid it. But i’m finding the switching controller chip is actually heating up. I’d like to buffer the signal before it gets to the inductor. I’ve fashioned a simple push pull amplifier, the output waveforms look pretty identical although now the arc doesnt ignite. Any thoughts on buffering the push pull signal? 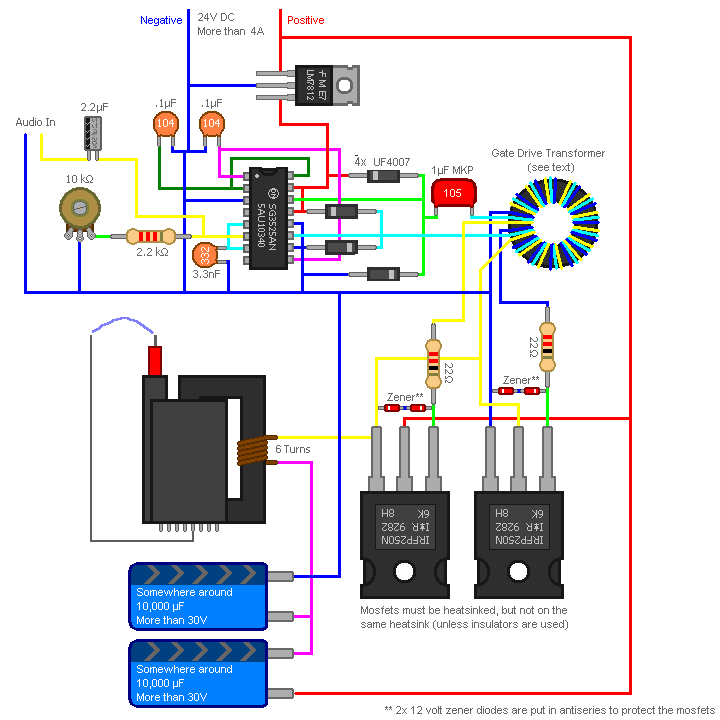 td8f4 A simple AB amplifier should be just fine. Remember though, mosfets are switched by voltage, not current like BJTs. Hello, i might need some help. i have buld part of the circuit, but am unsure of if my GDT is what is required here. here is my circuit, it is still missing the mosfets, zeners, caps, and 22 Ohm resistors. Since the images are not so clear the both measurements ar at 10micro seconds. the firs one is 2v per devision and the second .2V per devision. Does it seem ok to you? Im curious what the maximum input current is for this circuit?? Meant to build this like 2 years ago when this used to be teravolt and finally getting around to actually potentially building this, was wondering though while I gather the missing parts I need, would it be even more effective to use a lm7824 or would the additional 6 volts would just go to waste since this extra voltage is only fed to the lg3525 ic and the transistors go with the 35 volt straight from your source anyway? Hi, another forum member, found your old simulation done in LT Spice IV. It shows three separate waveforms Vgm1, Vgm2, HVout. I’m very new to LC Spice and I would like to know where in LT Spice to setup the command etc. LTspice is interesting in that it supports “forced” spice directives. Instead of fiddling through 1,000 menus to find what you need, in LTspice all you do is paste in for example, “.function normal(nom,tol) nom*(1+gauss(tol))” to define a random, Gaussian value function. Adam, I found out how to create new Plots and how to name and setup my traces, with a right click. Thanks for the response. I’ll be building this now and I hope I’m able to get a good transformer. Any suggestions? I’ll by a new one if they have it, somewhere. I am getting a lot of static when inputting the audio. The initial arc without audio is basically silent but when adding audio a static sound drowns out most of the audio. Have to put it full volume just to sortof hear it. The source audio is clear in headphones or speakers. Any ideas what this might be? I finished this finally had some trouble with the Core I was trying to use from a Computer Power Supply. Once I had the one suggested all went as expected. I stress tested it for 6 hrs. It did just fine. Good circuit. Can you give more detail for the toroid you use? What inductance and impedance are we looking for? Where or how can i get the flyback transformer? Thanks! Heh, I pulled that out of a switch mode power supply. I really haven’t a clue what any of its specs are/were. FBTs can be pulled from old TV sets.